The public ran out of chairs at a rather packed meeting of the town council on Tuesday, 18th June. People had come because they were concerned about plans for 41 homes at 82 Mount Pleasant, near Spire View. Mr Ken Allison was the first to speak in the public forum, with a complaint about the speed of traffic along St. Bernard's Avenue. He said drivers "use it as a chicane. They don't stop at the roundabout. The signs aren't very clear." He asked "is there any way we can slow traffic down before anybody gets killed?" Councillor Laura Stephenson said "There are a few places in Louth we have traffic problems, and that's one of them." Councillor George Horton recommended sending a letter to the police inspector with these concerns. Road safety is a perennial issue in certain areas of town, and it's one that's set to become more challenging as Louth grows in size. Ivor Beaman of Gladman developers returned to give an update on their plans for Louth's "southern gateway", the proposed development of homes around Legbourne Road. Some of the issues they noted from the feedback included "smells from the farm, and why so many houses were needed." In response the developers have produced revised plans, including a change of route. It emerged that this map wasn't online at the time of the meeting. "There is a huge resentment about this," Councillor Jill Makinson-Sanders said. "We don't want people coming along and simply spoiling the town." Mr Neil Overton stood up next, to speak for a group of people from Spire View Road, in objection to plans for houses at Mount Pleasant. "Our main issue is they are planning to access it through Spire View Road," he said. "There is a bit of a concern about flooding if the derelict land is then lost. We don't think this is the right site for this amount of houses." On the subject of flooding, I asked the council whether there was anyone responsible for producing a map of surface water flooding within the town. The Environment Agency maps river flooding quite well, but when it comes to surface water flooding it doesn't seem to have the data. Councillor Makinson-Sanders said "I don't think it would be possible for the Environment Agency to produce such a map. Why can't we have a smaller number of houses?" However, I believe the council won't be able to argue convincingly against having more houses in town without evidence of flooding. And if there are no maps, this evidence won't exist to present to planners. This development was the first item on the agenda. Councillor Roger Featherstone noted concerns about "over intensification", and said that the planning sub-group recommended objecting. The town council voted to refuse this application, a result that Councillor Horton said he was "delighted" with. He wasn't the only one: members of the public applauded when this was decided. The final decision has to go to ELDC, and Councillor Andrew Leonard recommended sending "a robust set of objections" with this application. 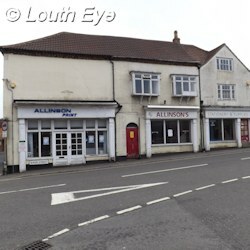 At the previous council meeting on 4th June, the council was all set to organise a public meeting about the Legbourne Road development in the very near future. However, following comments from ELDC planning officer Anne Shorland, who called the planned meeting "a bit premature", the town council have opted to defer the meeting until a later date. The council considered plans for the former Allinson's building at the corner of Queen Street near the bus station. These are for ten dwellings (a mixture of flats and houses). Councillor Featherstone noted concerns about the amount of car parking for people living there. Councillor James Pocklington said "there isn't any cycling storage either." However, the design proved more controversial. Some councillors were keen to see the site cleaned up. Councillor Chris Green said it was "a disgrace it's been allowed to go on that long." But Councillor Leonard criticised the design for being "drab and uninteresting." The vote was fairly close, with 8 councillors voting to approve these plans, compared with 5 who opposed them. The council regularly deals with plans for work to trees, and usually this is pretty minor. But there was an application to fell 36 trees on the site of the Quarry, which borders on the town cemetery. The reason for this work was to "slow the rate of collapse of the quarry walls." Councillor Makinson-Sanders pointed out that there is a petition about this. "Green space is important and trees are important," she said. Councillor Leonard asked whether felling trees would weaken the quarry walls even more, and he suggested consulting an arboriculturalist. "We need to be sure our asset is safe," he said, referring to the cemetery. The council voted in favour of consulting a tree expert. I can't say whether this application will reduce erosion or cause yet more, but it does seem quite drastic, at a time when every inch of green space and derelict land seems to be being eyed up by developers.